Mumbai: Senior BJP leader L K Advani yesterday refused to offer any appology over the 2002 post-Godhra riots in Gujarat. Advani made this statement while addressing a programme “Face the Press” organised by the Mumbai Press Club. He replied to many questions posed by veteran journalists like The Hindu Editor-in-Chief N. Ram, Star India CEO Uday Shankar, Kumar Ketkar of the Dainik Bhaskar Group and Ajit Ranade of the Association for Democratic Reforms. “You are talking of regret and apologies. I understand there have been many riots in Hindustan. It is very often that handling of a situation…is lack of governance. The issue of an apology does not arise. But it is sure that riots are a sad issue,” Advani said. He said that if anyone in the government had done anything wrong, the matter would be examined by the court. Advani said the developments in the 2G case were not merely due to the Opposition or the public opinion, but “the clincher has generally come from the judiciary… particularly the Supreme Court”. He also credited constitutional bodies such as the CAG for this and said there was a “sense of disgust” in the country against corruption. 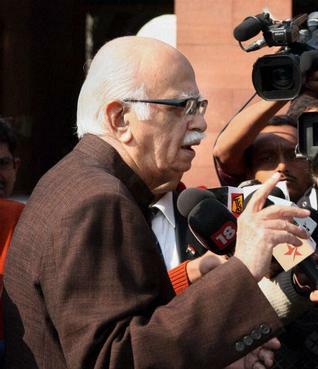 On the demolition of Babri Masjid, Advani said the Hindutva outfits had failed to anticipate the “impatience of the people” and hence it was necessary for the movement to have been planned properly. He added that the demolition was not planned and had taken the leaders “totally by surprise”. When asked about his views on India’s invitation to Pakistani President Asif Ali Zardari to see the semifinal match of the ICC World Cup 2011 between India and Pakistan at Mohali, the BJP leader said: “I have no objection to inviting the Pakistan president. I am happy that they have forgiven someone in prison after 27 years in response to an appeal made by the Supreme Court of India, where his parents had filed an application. A similar case has been pending, I will be happy if more people are released.” But he added that there must be zero tolerance to terrorism. “The situation in Pakistan had become so worse,” said Advani quoting former Pakistan President Pervez Musharraf’s interview to Time magazine.